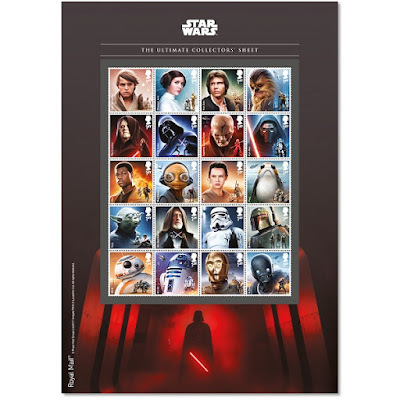 When news first broke about the latest offering of Star Wars stamps from Royal Mail there was a long list of products but the information provided was very short on detail. Even in their Philatelic Bulletin the technical details of the 'Ultimate Collectors Sheet' and the 'Droids, Aliens and Creatures Collectors Sheet' was sparse. On the basis that there might just be something collectably different about these, I ordered one of each because Royal Mail had still not provided the requested information. 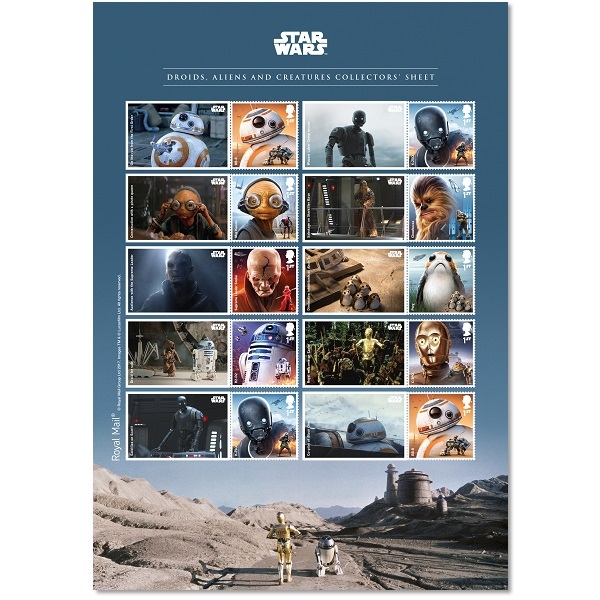 The 10-stamp Droids, Aliens and Creatures Collectors Sheet (Product code AT098 costing £7) is self-adhesive, producing 8 new stamps (the pair in the top row are repeated in the last row). Four of them will be in the retail booklets but those are printed by the Walsall branch of ISP in gravure, and these sheets are almost certainly printed by the Cartor branch in litho. The phosphor band arrangement is the same as in the booklets, but the (see below) glow-in-the-dark features - which show equally under UV light - can only be seen in normal light on the booklets (held at an angle to light, in the same way that you would for phosphor bands). As usual these stamps are not likely to be separately listed in the Stanley Gibbons catalogues. The 20-stamp Ultimate Collectors Sheet (Product code AS3093COLL costing £17.50), however, is on ordinary paper with ordinary gum. And this explains why only 8 stamps this time. With 12 stamps in the first set, 10 this time would have produced an odd layout and 12 would not have allowed much room for border illustration. Hidden features. Readers will recall that the design of the 2015 set included logos that were revealed under UV light. I forgot to mention earlier that some of the latest stamps have similar design features. 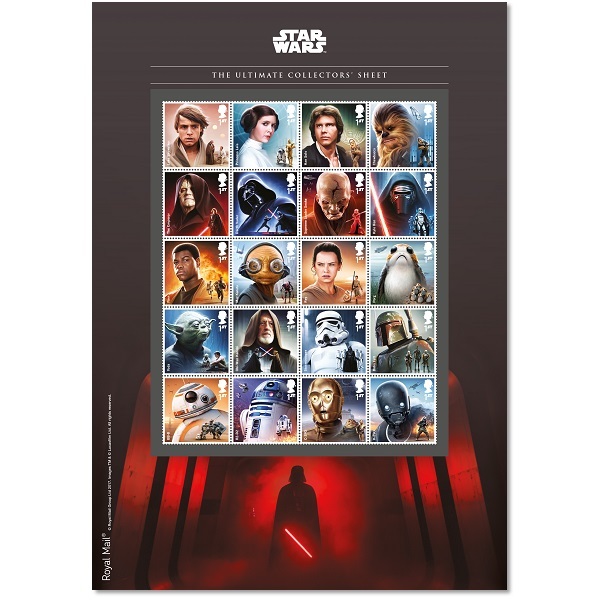 The stamps showing BB-8, R2-D2, C-3PO and K-250 have glowing eyes or panel lights. The humanoid and creature stamps do not, which means that only one of the counter sheets has this secondary invisible colour. Some illustrations of the retail booklets provided by Royal Mail appear to show the edge inscription on the retail booklets 'glowing' as if under UV light (while other illustrations do not). On the packs we have, the booklets have no hidden feature which is revealed by UV light apart from the 'eyes' mentioned above. Temporary closure of our web shop.